Unlike most flowers, crocuses bloom in the most adverse conditions. While other flowers need aerated beds and warm weather, crocuses grow best in gritty soil and blossom in early spring, even when snow is still on the ground. In a way, this flower is the ideal metaphor for Yellow Crocus, a novel about a young girl growing up with her enslaved nursemaid on a nineteenth-century Virginia plantation. The story begins as Mattie, a twenty-year-old slave leaves her own baby to be a wet-nurse for Lisbeth, the newly born daughter of her master. Naturally, in due time, the new baby winnows her way into the nursemaid’s heart. Mattie teaches Lisbeth everything she knows about life—from songs and prayers to eating black-eyed peas. Lisbeth longs to keep Mattie close, but as the little girl grows, she realizes how cruel it is to keep her nursemaid from her own family. After Lisbeth’s family separates them, Mattie takes a desperate chance at freedom, an action that eventually forces both women to make decisions in their lives that will defy all the rules. Ibrahim balances the story well, crafting immensely complex and multi-faceted characters and putting them in an atmosphere as tense as the air before a thunderstorm. It isn’t just Lisbeth and Mattie who possess this richness. Lisbeth’s mother struggles for respect in her home against the uptight matriarchs of her husband’s family, but is not afraid to read an abolitionist’s pamphlet in front of them. Emily, a light-skinned house maid, stands in the background of many scenes, her silent behavior taking on a whole new meaning as the story unfolds. 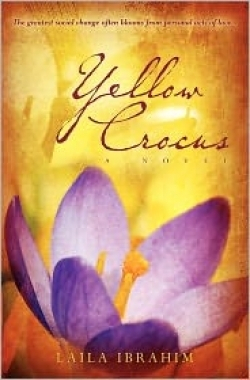 All in all, Yellow Crocus is an engaging, thought-provoking story. It’s a must-read for anyone who enjoys Antebellum historical fiction or is looking for a compelling story to add to their book club reading list. In fact, practically anyone who enjoys period reading will find this book as wonderful as discovering freshly bloomed crocuses poking through the snow.